BCPL Dibrugarh Recruitment 2018 : Foreman, Operator, Technician Posts :- Hello Assam Career Job Seekers. We hope you are a frequent visitor of our portal. 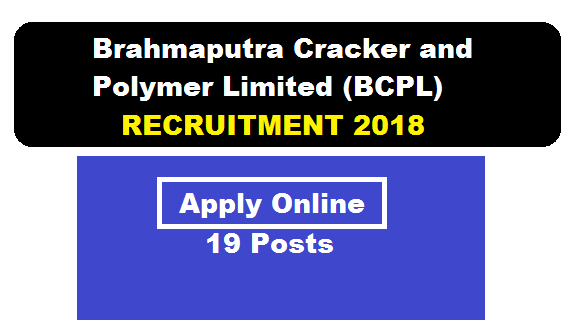 In this article we will mention Brahmaputra Cracker and Polymer Limited (BCPL) new recruitment 2018. According to the latest BCPL Dibrugarh Recruitment 2018, online application are invited to fill up total 19 number of various vacancies in Brahmaputra Cracker and Polymer Limited (BCPL). In the nexe section we will be mentioning full details about this BCPL Recruitment Job. In this section, we will discus in detail about Recruitment of various Posts Under BCPL Assam Recruitment 2018 with all the details and requirements . No of posts: 02 [SC-02] Educational Qualification: Candidates must passed Diploma in Engineering in Chemical / Petrochemical / Chemical Technology / Petrochemical Technology with minimum 55% marks. No of posts: 01 [UR-01] Educational Qualification: Candidates must passed Diploma in Engineering in Electrical / Electrical & Electronics with minimum 55% marks. No of posts: 10 [UR-05, OBC-03, ST-02] Educational Qualification: Candidates must passed Bachelor Degree in Science (B.Sc.) with subjects of Physics, Chemistry & Mathematics with minimum 50% marks or B.Sc. (Honours) in Chemistry with minimum 50% marks. No of posts: 3 [UR-03] Educational Qualification: Candidates must passed 10+2 or equivalent with minimum 06 months Fireman’s Training course. Driving License for heavy vehicle / Fire Tenders; Proficiency in operating the pump / other firefighting equipment. No of posts: 2 [OBC -02] Educational Qualification: Candidates must passed Matric plus ITI Tradesman ship/ National Apprenticeship Certificate in Fitter / Diesel Mechanic / Machinist / Turner trade. Mode of selection : Written Test and/or Trade Test and/or Endurance Test and/or Proficiency Test as applicable. Eligible and interested candidates may apply online through BCPL website www.bcplonline.co.in from 11.07.2018 10:00 am to 10.08.2018. Application Fee: Candidates belonging to General and OBC category are required to pay a nonrefundable application fees of 50/- (Rupees fifty only). SC/ST/PH candidates are exempted from payment of above fees provided they produce SC /ST/PH certificate as applicable, issued by the Competent Authority at the time of interview. The fees once paid will not be refunded on any account nor would this fee be held in reserve for future exam / selection.Payment can be made through net-banking / credit card / debit card only. No other mode of payment will be accepted. The payment can be made by using debit card.